I’ve written about my love of the subscription box trend. Whether it’s new foods and snacks, or crafts for the kiddos, we’ve been having fun in my house trying out all the different brands and types of boxes. 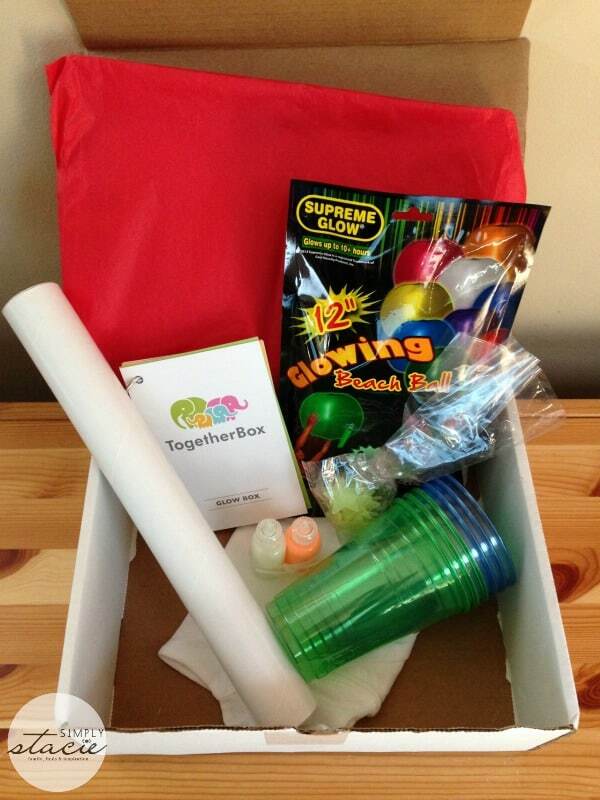 When the opportunity to review a box from TogetherBox came up, I was intrigued by their focus on family fun. Their website promises hours of family fun in every box, and my boys and I were eager to put that promise to the test! We received a glow-themed box from TogetherBox for review. When it arrived, I have to say, this was it was quite unique. It was filled with not only craft activities, but also items designed to get us up and moving (something that’s sometimes tough to do during these long New York winters). As I read through the instruction and suggested uses for the items, I thought the best place to start was with the glow in the dark stars. I knew I would be able to have both my boys participate in a project using these. I like that the instruction booklet gives you different ideas on what to do with each item, but what I like the most is that a lot of these items lend themselves to open interpretation. 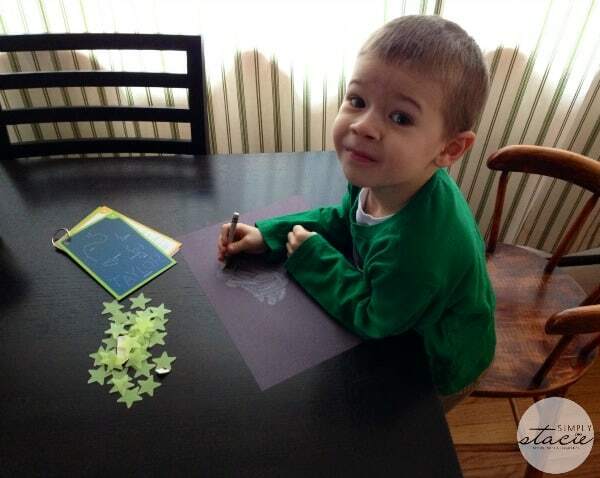 The booklet suggested using the stars on our walls, but I thought it would be easier for both of my boys to use their creativity with the stars by doing their own art project with them. I gave them white crayons and black construction paper and let them create their own design, embellishing their papers with the stars. They had a blast putting together their own glow-in-dark creation and we’ve hung their masterpieces in their rooms for them to enjoy. In the box was also a small white t-shirt and puffy paint and I let my five-year-old go wild in creating a shirt for his favorite stuffed bear (disclaimer, I made the heart for him!). 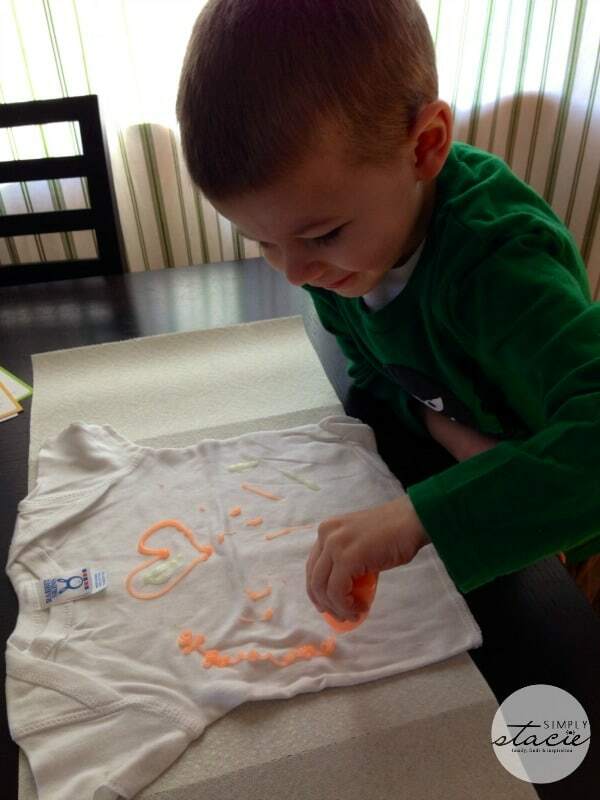 He had never done a project like this before and he was giggling the entire time – I love that he had so much fun doing this! 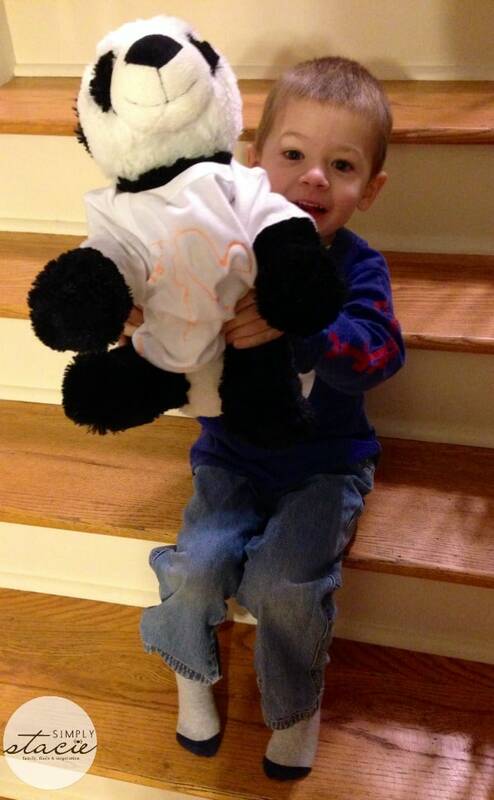 When the paint was dry he put the shirt on his panda bear and insisted on bringing it to school for show and tell so that he could show off his work. 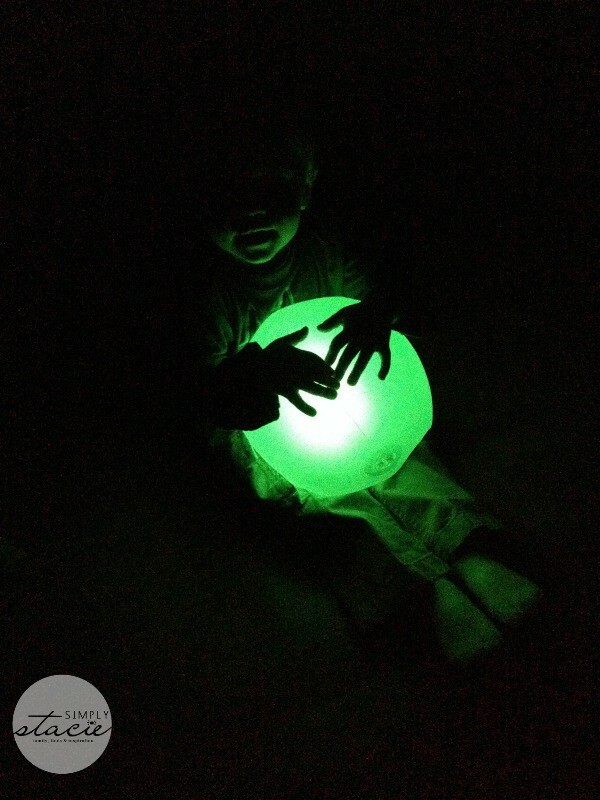 My little guy, his favorite part of the box was the glow-in-the-dark beach ball. Since it gets dark so early, we decided to have a little party after dinner one night where we turned off all the lights and played catch and rolled the ball to each other in the dark. It was fun for all of us, and it was nice to be able to play something new and different. This box was a definite boredom buster in our house! We still have some glow sticks and neon cups in the box that I’m going to save for some summertime night time fun. TogetherBox offers three levels of subscriptions to fit your needs. You can order monthly, at $29.95 per box or you can subscribe for 3 months at $27 per month, or for 6 months at $24 per month. Shipping is free no matter what level you choose, and you can cancel at anytime. They also offer an option to give TogetherBox as a gift. The suggested age range for each TogetherBox is 3-10 and I thing that’s pretty accurate – my 5-year-old was able to complete many more tasks and understood a lot more than my 2-and-a-half-year-old did (although we were able to get my little guy involved in most of the projects). Every box has a surprise theme each month that will get the whole family involved in working and playing together. You can see some Sample Boxes on their site to get an idea of whats been in past boxes. To learn more about TogetherBox, visit their website. While you’re there, be sure to sign up for their newsletter – you can find a subscription box on the bottom of their homepage. This would be a fun one for the grand kids.. thanks for the chance to win.